This thread has moved to a new owner. Suggestions should be directed to the suggestion thread. Like the mod and have a few coins to spare? Becoming a patron keeps adf.ly off of the download links and goes towards hosting or development of the mod. It also has some nifty rewards for supporting me! By popular demand, 1.7.2 links have been added. Alpha version, new content building in progress. Expect bugs! Stable version, recommended for servers. Final version, recommended for servers. Now unsupported. - Fixed electrum. We know it crashes, now it doesn't. - Obsidian ingots are castble again. - Fix a bug, that when activating a faucet and the draining fails, the next attempt to activate it would do nothing. 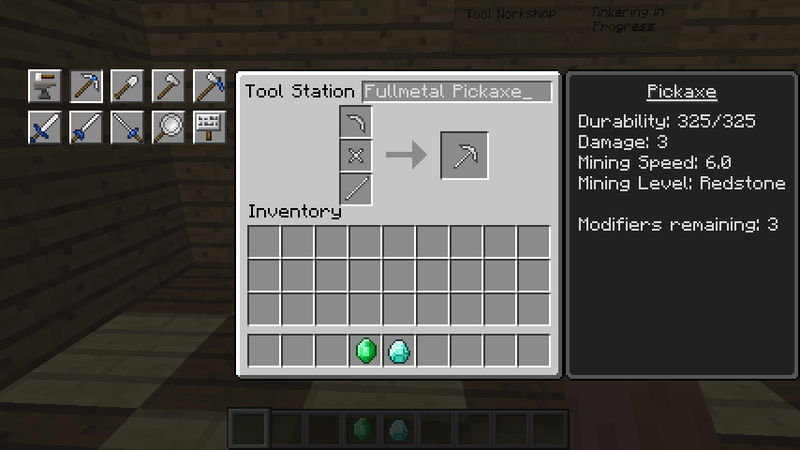 - Fix Mattock using vanilla damageItem. Caused Mattock to vanish on breaking. - Updated to Minecraft 1.7.10. 1.7.2 is not supported. - Many undiscovered bugs may be present. - Tool Forges can name every item provided they do not have a name. - Mod separated internally into modules. Modules can be disabled, but this process is not yet finished. - Casting Channel behavior with faucets should be quite useable now. - Changed how hearts render to better represent poison and wither status. 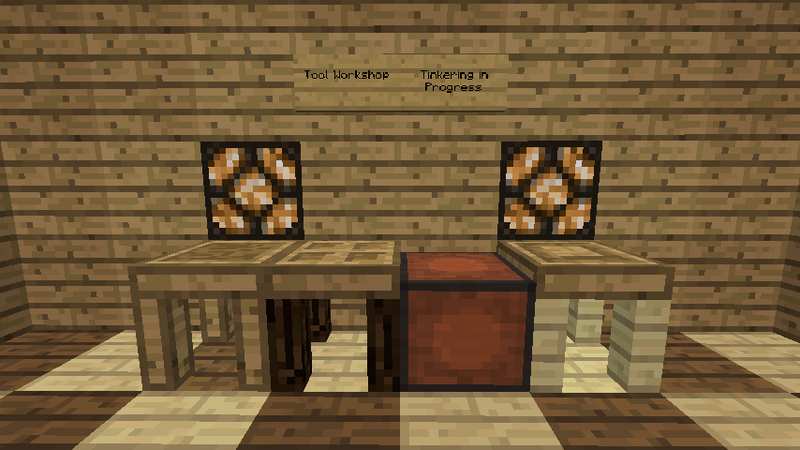 - Fixed duplications of crafting in the crafting station and no you can't do it anymore! - Added a crafting recipe for the exo-suit, config value disabled by default. - Aluminum ingots are now registered as "aluminum" and "aluminium" instead of "naturalAluminum"
- Fixed a crash when a drawbridge is placed in another drawbridge's camo slot. To get started you need a few tables and a place to put your patterns. You build, modify, and repair tools like so. 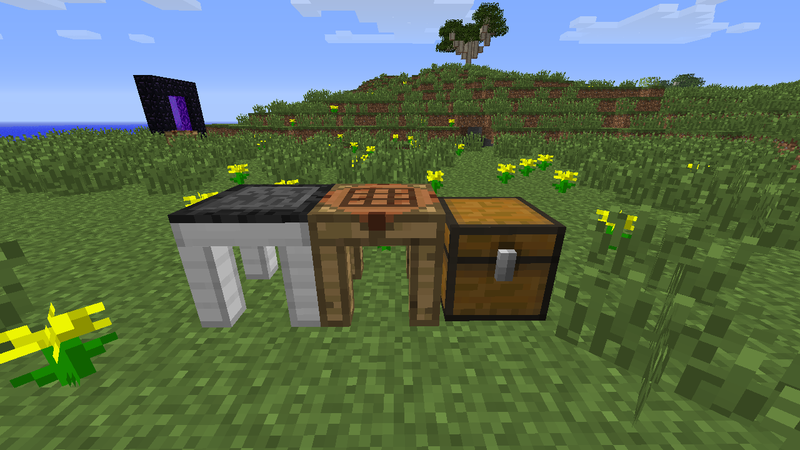 1.2 brings a new multi-block structure for turning metals into liquids. 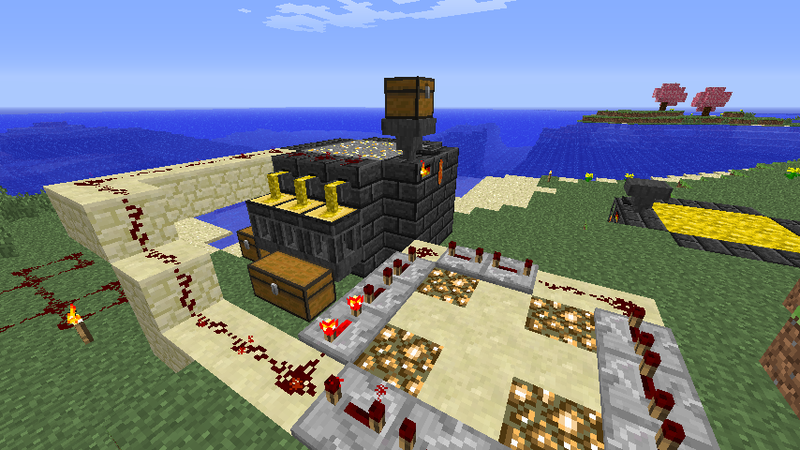 It can be automated with redstone and hoppers. The mod also brings a few mobs to the game, like this fellow here. And that's all there is to it! There's a lot of depth in the system, and most things are documented in-game. Anything that isn't is left for you to explore. Q: My tool places torches/blocks on right-click, is this a bug? A: This is intentional. And useful. Q: I'm playing with Aether 2 or Galacticraft and I can't see the armor tab, help! Q: What other mods does this support? A: Anything with copper and bronze ingots can be turned into tools. XyCraft aluminum and TConstruct aluminum are equivalent, and IC2 has an electric modifier. 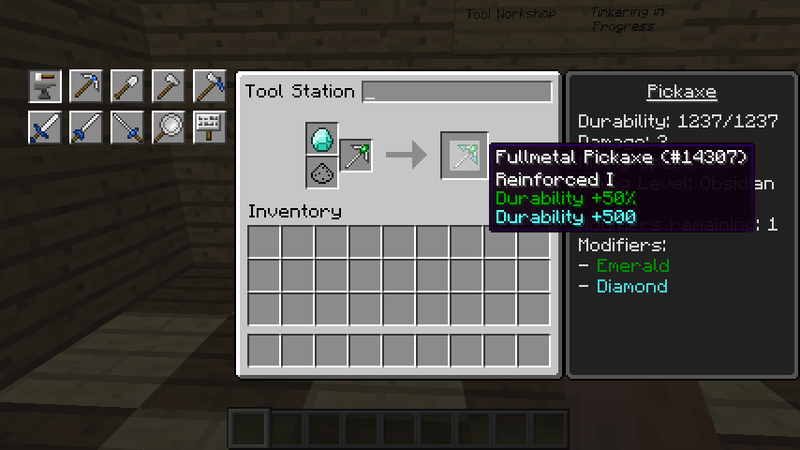 Metallurgy is supported through an addon - check the downloads section. There is specific compatibility built in for Minefactory Reloaded, Waila, Forge Multipart, and a few others. Q: What mods are incompatible with this? A: MultiMine prevents the broad area on Tier 2 tools from working. GregTech may not work at all. OptiFine and any bukkit envrionment (MCPC+, BukkitForge) aren't supported either. Q: I have a bug with 1.5.2. Can you fix it? A: Report 1.5.2 bugs here. Q: I can't update because of other mods/modpacks! A: This is a personal choice that we will not cater to. If you're going to use a modpack, you accept all responsibility for updating mods yourself, like you normally would. Likewise, not updating because other mods haven't updated does not mean we have to support you. It's unfair to ask us to fix bugs that have already been fixed in later versions of Minecraft. Q: I gave myself some tools from /give or NEI and it crashes! A: You have given yourself a default tool with no data. The tool really needs the data. Pull one out of the creative menu or put the parts together normally. First, make sure you've downloaded and installed Minecraft Forge. (alternate) TConstruct goes in the mods folder inside .minecraft or your server's mods folder. If you're still having problems: run this Error Test and post the results on this thread. This mod is covered under the Creative Commons 3.0 license. Modpacks are encouraged, feel free to do anything you like with it. I only ask that you enjoy it! Source code can be found on github under a Public Domain license. 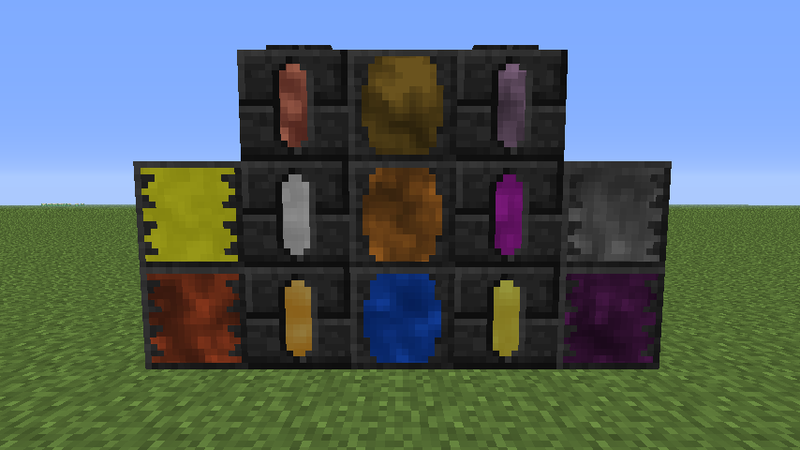 Even if I added the ores, there's no way to process them right now. 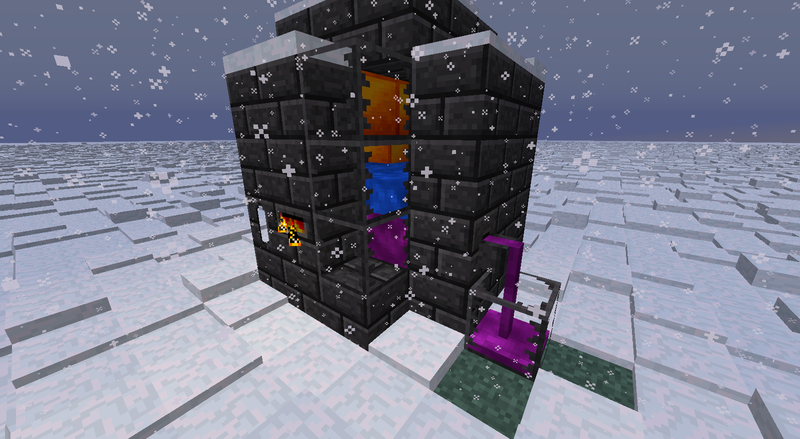 You'd need the smeltery, casting table, hardened moulds, upgraded tool station... what you're seeing right now is tier 1. Tier 2 will come later. I firmly believe this mod is as worthy of a place among the Great Tech Mods of Eternal Mechanisms as all the other greats that have earned a position in its glorious halls. Keep up the epic work, mDiyo. EDIT, May 14, 2013: W00t, congrats on 100 pages of posts! It's been a while since I got this post on the first page and TConstruct has come such a long way since then. And it's been an awesome road, with no speed limit, no end in sight and a whole lot of interesting scenery in the rearview and coming up ahead. 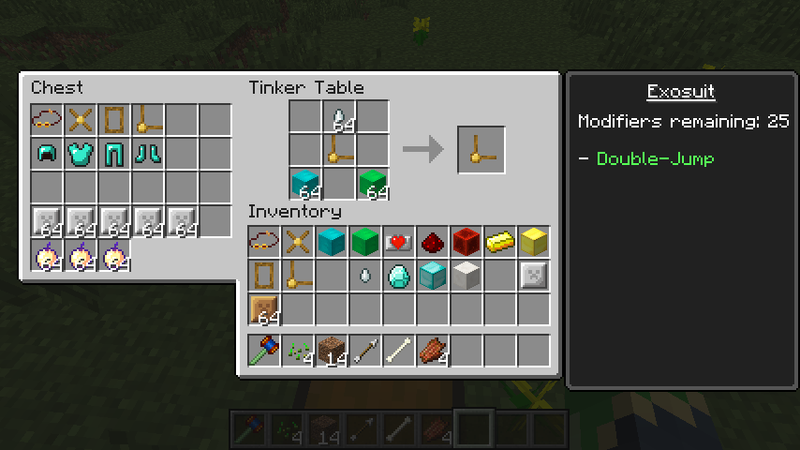 Upcoming TC4 Additional Aspects Addon -- give mod blocks aspect values! Want to help? Click and read! Good idea putting T Construct here. Thanks for our advice on Mo Creatures BTW, but I already had it installed. Anyway, loving this mod, best one ever. Are you going to make armour have slots, so you can put modifiers in them. [shaking with excitement]. Would you like me to make you a Mod Spotlight video? A mod spotlight would be lovely. Go for it! Just installed your mod and its absolutely lovely. I enjoy being able to customize my weapons and tools before enchanting and having something other than just plain swords as weapons. mDiyo, could you please put a changelog here as you did with Inficraft, it would just come in handy. I see this got a separate thread from Inficraft. Ooh, this sounds awesome. Was going to skip over due to my large amount of extra tools already from 100+ mods. But IC2 electric modifiers? This sold it for me. One thing that'll be incredibly interesting to see, is tools with Thaumium bits in it. In my mind, it'd allow for the Thaumic enchantments. Or add a wand to a tool to add wand abilities . I assume there would be some restrictions in place/put in place at some point to prevent overpowered tools. Cheers, Optical - Yami no Yami! - Is it not better to be yourself, than to be reforged anew, wherein lies, hate, and guilt are contained, ready to erupt at any moment? OpenGL: AMD Radeon HD 7310 GL version 4.2.11554 Compatibility Profile Context, ATI Technologies Inc.
am having trouble, here's the report. Cool mod, thanks! Im started making SphaxPureBDcraft patch for your mod! Link. Such a warm reception. For future reference, any mod spotlights, texture packs, modpacks, or anything else is fine with me. I have found a couple minor bugs that made it past the bugzapper on the way out. Nothing gamebreaking, just working out the kinks in a new mod. _i_n_h: I will put up a changelog when there's anything on it to post. Marvl101: Odd, I thought I had that down perfectly. Something must've shifted between beta and release. 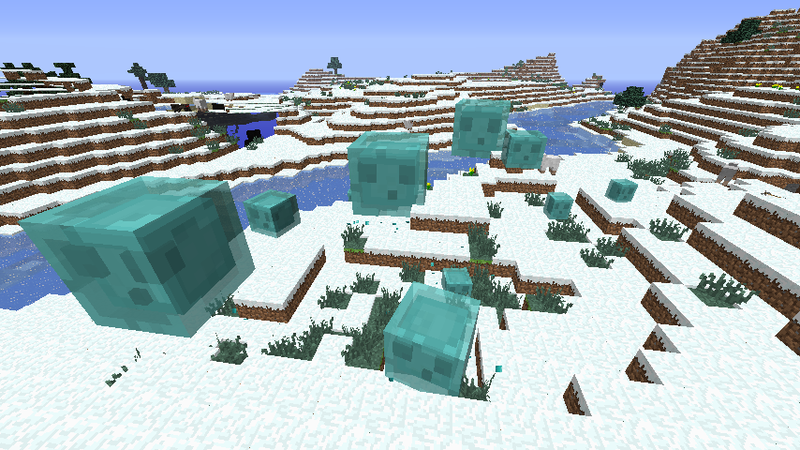 Herobrine273: It looks as if you have one of the botched versions of Forge. Update to the recommended please. KarasuTamashii: The table can get laggy if you have a poor connection to the server.